The first accession of the Duke fonds arrived in forty-five banker boxes. While much of the material had an established arrangement, an initial inventory describing the items in each box arrived with the accession. 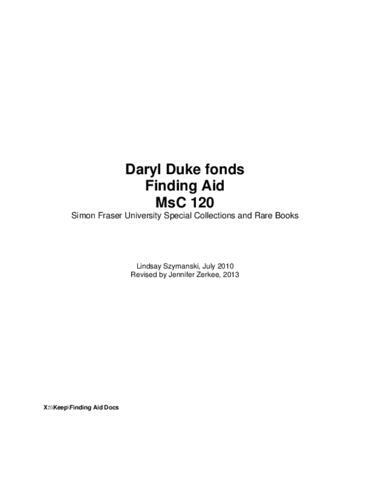 Each original box contained items related to many aspects of Duke's activities but there was little apparent order within each box. The archival assistant therefore assigned series while processing the fonds. Series are based on the major activities and types of materials present. As records were transferred into archival boxes and folders, the archival assistant physically re-arranged the individual files to make them more coherent and accessible for future researchers. The original order within the files has not been changed. The second accrual to the Duke fonds consisted of fourteen banker boxes. The same series were assigned to the new material, and again, the archivist physically arranged the individual files for coherence and accessibility. Series descriptions and file list are available. Norman Klenman was a close friend and working partner of Daryl Duke for most of his career. His presence is felt throughout the collection and his own fonds can be found in the SFU Special Collections and Rare Books Archives, in MsC 101. Includes ca. 430 photographs, 54 videocassettes, 22 audio reels, 15 books, 12 architectural drawings, 4 maps, 4 placards, 2 posters, and 1 mini-cassette.